Rocky Mountain spotted fever first emerged in the Idaho Valley in 1896. At that time, not much information was known about the disease; it was originally called Black Measles because patients had a characteristic spotted rash appearance throughout their body. The first clinical description of Rocky Mountain Spotted Fever was reported in 1899 by Edward E. Maxey. Howard Ricketts (1871–1910);an associate professor of pathology at the University of Chicago in 1902, was the first to identify and study R. rickettsii. At this time, the trademark rash now began to slowly emerge in the western Montana area, with an 80-90% mortality rate. His research entailed interviewing victims of the disease and collecting and studying infected animals. He was also known to inject himself with pathogens to measure their effects. Unfortunately, his research was cut short after his death, likely from an insect bite. S. Burt Wolbach is credited for the first detailed description of the pathogenic agent that causes R. rickettsii in 1919. He clearly recognized it as an intracellular bacterium which was seen most frequently in endothelial cells. The Ixodidae are the family of hard ticks or scale ticks, one of the two big families of ticks, consisting of over 700 species. They are known as 'hard ticks' because they have a scutum or hard shield, which the other big family of ticks, the soft ticks (Argasidae), lack. They are ectoparasites of a wide range of host species, and some are vectors of disease. By having multiple modes of transmission this ensures the persistence of R. rickettsii in a population. Also, by having multiple modes of transmission this helps the disease adapt better to new environments and prevents it from becoming eradicated. R. rickettsii has evolved a number of strategical mechanisms or virulence factors that allow them to invade the host immune system and successfully infect the host. Since R. rickettsii needs a moving vector to contract the disease to a viable host it is more likely that this pathogen has moderately low virulence levels. This idea is supported by the tradeoff hypothesis which suggests that virulence of a pathogen will evolve until the level of virulence balances out with the level of transmission to maximize the spread of the pathogen. R. rickettsii invades the endothelial cells that line the blood vessels in the hosts body. Endothelial cells are not phagocytic in nature; however, after attachment to the cell surface, the pathogen causes changes in the host cell cytoskeleton that induces phagocytosis. Since the bacteria can now induce phagocytosis the R. rickettsii gene can be replicated and further invade other cells in the hosts body. R. rickettsii is found on every continent excluding Antarctica. 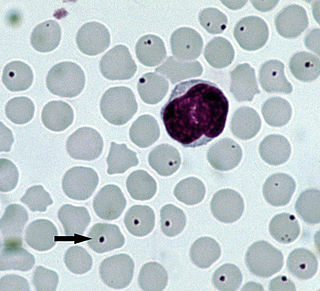 The disease was first discovered in North America and since then has been identified in almost every corner of the earth. The spread of R. rickettsii is likely due to the migration of humans and animals around the globe. However, R. rickettsii tends to thrive in warm damp places and this can be seen by contraction rates around the world. Environments are constantly changing so the fluctuation of the disease is never constant in a population and this correlates to the evolution of R. rickettsii. The Centers for Disease Control and Prevention states that the diagnosis of Rocky Mountain Spotted Fever must be made based on the clinical signs and symptoms of the patient and then later confirmed using specialized laboratory tests. However, the diagnosis of Rocky Mountain Spotted Fever is often misdiagnosed due to its non-specific onset. If not treated properly the illness may become serious, leading to hospitalization and possible fatality. The classic Rocky Mountain Spotted Fever rash occurs in about 90% of patients and develops 2 to 5 days after the onset of fever. 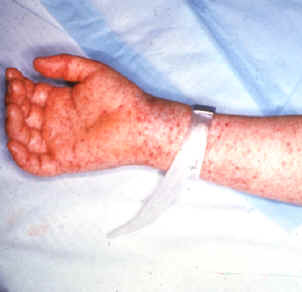 The characteristic rash appear as small, flat, pink macules that develop peripherally on the patient's body, such as the wrists, forearms, ankles, and feet. During the course of the disease, the rash will take on a more darkened red to purple spotted appearance and become more evenly distributed. Diarrhea, abdominal and joint pain, and pinpoint reddish lesions (petechiae) are observed during the late stages of the disease. Rocky Mountain Spotted Fever is often diagnosed using an indirect immunofluorescence assay (IFA), which is considered the reference standard by the Centers for Disease Control and Prevention (CDC). The IFA will detect an increase in IgG or IgM antibodies in the bloodstream. A more specific lab test used in diagnosing Rocky Mountain Spotted Fever is polymerase chain reaction or PCR which can detect the presence of rickettiae DNA. Immunohistochemical (IHC) staining is another diagnostic approach where a skin biopsy is taken of the spotted rash; however, accuracy is only 70%. Doxycycline and Chloramphenicol are the most common drugs of choice for reducing the symptoms associated with RMSF. When it is suspected that a patient may have RMSF, it is crucial that antibiotic therapy be administered promptly. 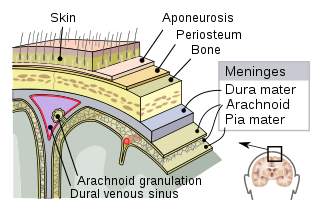 Failure to receive antibiotic therapy, especially during the initial stages of the disease, may lead to end-organ failure (heart, kidney, lungs) meningitis, brain damage, shock, and even death. The main preventive measures are taken by containing and eliminating the carrier of the pathogen. Wearing long sleeve shirts and pants when in grassy areas provides a barrier from possible tick bites. By clearing leaf piles from the yard this will lessen the likelihood of ticks being in close proximity. Also by placing piles of wood in the sun eliminate the chance for ticks to reside in them. According to the CDC, using insect repellent and checking pets for ticks after being out in wooded or grassy areas can decrease the chances of being bitten by a tick carrying the pathogen significantly. 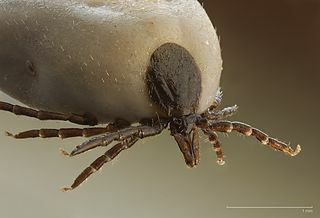 Haemaphysalis leporispalustris, the rabbit tick, is a species of tick that is widely distributed in the Americas, stretching from Alaska to Argentina. H. leporispalustris is known to have one of the largest distributions for a tick originating in the New World. It is a three-host tick and a member of the family Ixodidae, commonly called the "hard ticks," and the genus Haemaphysalis. Its common hosts are rabbits, hares, and sometimes ground-feeding birds. H. leporispalustris has a rigid scutum and a prominent capitulum projecting forward from its body and is often said to look like the "wood tick". It has a hemimetabolic life cycle. H. leporispalustris does not play a prominent role in disease transmission in humans but is a vector for disease in other animals. 1 2 3 Perlman, Steve J.; Hunter, Martha S.; Zchori-Fein, Einat (2006-09-07). "The emerging diversity of Rickettsia". Proceedings of the Royal Society of London B: Biological Sciences. 273 (1598): 2097–2106. doi:10.1098/rspb.2006.3541. ISSN 0962-8452. PMC 1635513 . PMID 16901827. 1 2 Parola, Philippe; Paddock, Christopher D.; Raoult, Didier (2005-10-01). "Tick-Borne Rickettsioses around the World: Emerging Diseases Challenging Old Concepts". Clinical Microbiology Reviews. 18 (4): 719–756. doi:10.1128/CMR.18.4.719-756.2005. ISSN 0893-8512. PMC 1265907 . PMID 16223955. 1 2 3 4 5 Parola, Philippe; Davoust, Bernard; Raoult, Didier (2005-06-01). 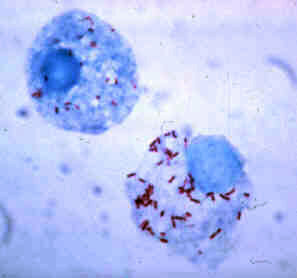 "Tick- and flea-borne rickettsial emerging zoonoses". Veterinary Research. 36 (3): 469–492. doi:10.1051/vetres:2005004. ISSN 0928-4249. PMID 15845235. 1 2 Tortora, Gerard J.; Funke, Berdell R.; Case, Christine L. (2013). Microbiology: An Introduction. United States of America: Pearson Education, Inc. pp. 661–662. ISBN 978-0-321-73360-3. ↑ Openshaw, John J.; Swerdlow, David L.; Krebs, John W.; Holman, Robert C.; Mandel, Eric; Harvey, Alexis; Haberling, Dana; Massung, Robert F.; McQuiston, Jennifer H. (2010-07-01). "Rocky Mountain Spotted Fever in the United States, 2000–2007: Interpreting Contemporary Increases in Incidence". The American Journal of Tropical Medicine and Hygiene. 83 (1): 174–182. doi:10.4269/ajtmh.2010.09-0752. ISSN 0002-9637. PMC 2912596 . PMID 20595498. Garrity, George; Brenner, Don J.; Staley, James T.; Krieg, Noel R.; Boone, David R.; Vos, Paul De; Goodfellow, Michael; Rainey, Fred A.; Schleifer, Karl-Heinz (2006). "Order II. Rickettsiales Gieszczkiewicz 1939..". Bergey's Manual® of Systematic Bacteriology: Volume Two: The Proteobacteria (Part C). Springer. pp. 96–. ISBN 978-0-387-29298-4. Weiss, K. (1988). "The Role of Rickettsioses in History". In Walker, David H. Biology of Rickettsial Diseases. CRC Press. pp. 2–14. ISBN 978-0-8493-4382-7. Weiss, E. (1988). "History of Rickettsiology". Biology of Rickettsial Diseases . pp. 15–32. Wilson, Brenda A.; Salyers, Abigail A.; Whitt, Dixie D.; Winkler, Malcolm E. (2011). Bacterial Pathogenesis: A Molecular Approach (3rd ed.). Amer Society for Microbiology. ISBN 978-1-55581-418-2. "Rickettsia rickettsii genomes and related information". PATRIC, Bioinformatics Resource Center. NIAID. "Rickettsia rickettsii: The Cause of Rocky Mountain Spotted Fever". Multiple Organisms: Organismal Biology. University of Wisconsin-La Crosse. 2007. Todar, Kenneth (2008–2012). "Rickettsial Diseases, including Typhus and Rocky Mountain Spotted Fever". Todar's Online Textbook of Bacteriology. "Rocky Mountain Spotted Fever (RMSF)". Centers for Disease Control and Prevention. 21 November 2013.